Thank You for supporting True North and our goal to make advance care planning easy, convenient and effective. We are truly grateful for the support of family, friends, patients like you. You'll be first on our list the day we launch the official version! TrueNorth Star! You will be added to our friend list on the website, AND You'll also get updated screenshots during development AND a secret, day-before-launch e-mail letting you know when we are going live! BETA TEAM: You'll be granted immediate beta access when we reach our campaign goal to try out TrueNorth for yourself. You'll also be invited to share suggestions via email during our final development phase. Experience TrueNorth and see how we are revolutionizing advanced care planning! CAREGIVING PROFESSIONALS: Be involved with TrueNorth's development process as we complete the final version with HIPPA compliance. We'll invite you to a weekly web conference where we'll show you the latest updates and features. 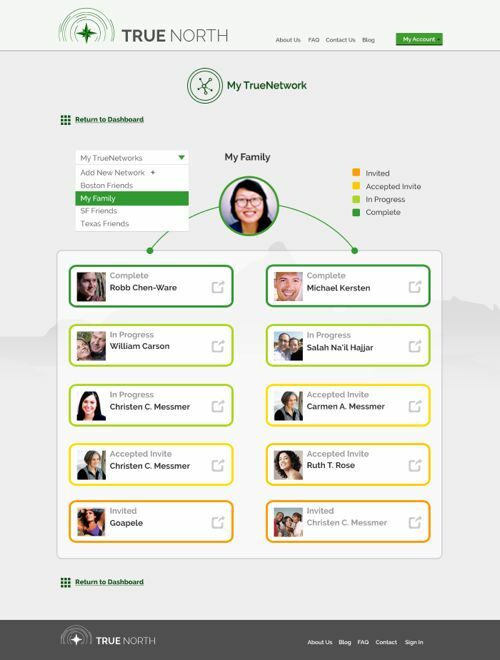 CAREGIVING PROFESSIONALS AND PARTNERS: All of the above, PLUS the TruePlan will be customized for your organization, including "white labeling" or including your organization's logo on our TruePlan for your patients. A TrueNorth member will be on -site for training of your staff on the platform and how to use the platform at your site. You will also be invited to a bi-weekly hour-long phone call to share your feedback directly and impact the future for TrueNorth and advanced care planning. You'll build connections with our team and extensive professional network. PARTNERS: In addition to all of the above, the TruePlan will be fully customized for your organization's needs. This will include not only the option to "white label" as described above, but also the customization of the questions posed to your users. Plus we will provide on-site consulting and management services regarding strategies for broad adoption of TrueNorth. We are open to your specific needs. You will also be invited to a bi-weekly hour-long phone call to share your feedback directly and impact the future for TrueNorth and advanced care planning. PARTNERS: Partners at this level will receive a full evaluation of how we can integrate TruePlan data into your electronic health records. The TrueNorth team along with its integration partners will develop a strategy for how data received through TrueNorth can be made available to providers where and when they're needed. Partners will also receive all of the above, including full customization of the TruePlan for your organization's needs ("white label" option and custom questions) and on-site consulting and management services regarding strategies for broad adoption. You will also be invited to a bi-weekly hour-long phone call to share your feedback directly and impact the future for TrueNorth and advanced care planning. Few things are more sacred than one’s end-of-life wishes. Yet, for something so personal and important, our healthcare system lacks a reliable mechanism to ensure these wishes are communicated during crucial moments of care. Choosing your healthcare advocate (the person who can make medical decisions for you if you’re too sick to make them for yourself – also known as a healthcare proxy, healthcare power of attorney, or surrogate) is one of the most important things you can do to make your choices known. It’s one part of what is called advance care planning – the process of discussing your values and choices for end-of-life and developing a valid expression of your wishes for future medical care. However, in a recent survey, even though 82% of people said it’s important to have end-of-life wishes in writing, only 23% have done so. 70% of people said they would prefer to die at home. In reality, however, only 32% of deaths occur at home – with 42% of people dying in a hospital and 18% dying in a nursing home. The Solution — What we do. Our solution begins with who we are – doctors, hospice counselors, and healthcare enthusiasts who see the potential for fundamentally changing the way we approach end-of-life care. We have been there – at the bedside with patients and families as we navigate the difficult decisions about care when people are really sick. We’ve seen when excellent communication and planning provide peace and comfort for patients AND their loved ones. We also know all too well the other side – the trauma, suffering, and stress that could have been prevented (see below for our bios!) Our software is based entirely on the cloud and we consider it the “turbo tax” of advanced care planning. Check out the current screenshots below and how the process works. A TurboTax-like “wizard” guides the user toward completion. Your healthcare advocate can be chosen from your Facebook friends or simply typed in. Emailing your advocate to schedule a talk is easy. The email is pre-populated for the user, and includes supporting resources for conversation. The TruePlan is populated with your entries, and as a pdf file, can be saved, printed, and shared securely. And we even go one step further to connect users with their chosen advocates and their loved ones. TrueNorth users can then use our Facebook app that allows them to invite their friends and family to join them in a TrueNetwork, a close circle of Facebook friends with whom they can share that they’ve completed a TruePlan and encourage them to do the same. These communication tools enable critical conversations around advance care planning to happen – even when families are geographically and generationally far apart. Inviting Facebook friends into a “TrueNetwork” motivates others toward advance care planning. How Can TrueNorth Help Patients and Families? We know that as many as 75% of us will rely on an advocate to make medical decisions on our behalf at some point. Yet advocates and families are often ignored or overlooked by advance care planning efforts. Surrogates experience extreme suffering from trauma, stress, and symptoms of PTSD due to poor preparation for decision-making. Families confront major financial strain with 62% of bankruptcies in the US caused by medical expenses and 43% of Medicare recipients spending more than their total assets (out of pocket spending) on end-of-life care. We believe TrueNorth can change the way that millions of Americans understand and express their choices for end-of-life care. We know that improved quality of end-of-life care not only respects patients’ choices but also reduces stress and trauma for loved ones. How Can TrueNorth Help Your Doctors, Nurses, and Care Team? As many as 76% of physicians whose patients had advance directives were unaware that they existed, forcing providers to follow protocols rather than patients’ choices. For providers (like us! ), TrueNorth can help us with the ethical and administrative burden of trying to understand and deliver the kind of care a patient truly wants. TrueNorth is the mechanism that the health system desperately needs to ensure your wishes are communicated during crucial moments of care, and can complement existing outreach and education efforts currently underway to promote advance care planning. 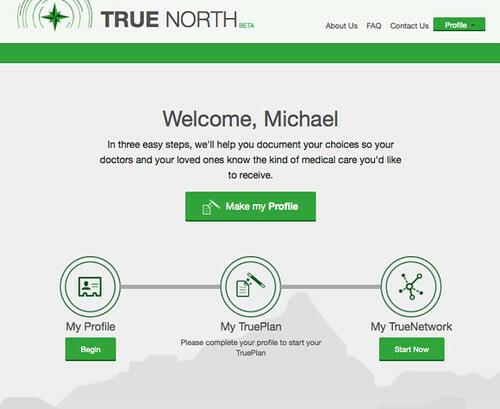 How Can TrueNorth Help Our Healthcare System? 25% of Medicare spend is on the last year of life, with the changing demographic shift in the nation likely to increase this number (Medicare beneficiaries will increase from 50 million to 80 million in 2030, with spending from $575B in 2013 to $1.4T in 2030). Advance care planning documents have been shown to improve the quality of care, improve patient and family satisfaction, and reduce spending on aggressive, unwanted care. However, we currently rely on an outdated paper-based system and are advance care planning documents are widely inaccessible when needed. TrueNorth can change this. Why do we think TrueNorth will work when other approaches have had limited success? 1. We know that too few people do it and they start too late. TrueNorth made this process easy for everyone (all ages) to start and complete. We built the “turbo tax” of basic advance care planning and focus specifically on what we think is the most important part – picking your healthcare advocate. We took what was complicated legal jargon on a piece of paper, and put it online with the focus on an amazing user experience and on health literacy. We believe that Americans are able and willing to have a conversation today about the things that matter today, including whom they trust to make medical decisions on their behalf. This isn’t rocket science BUT it is the most important decision you can make! 2. We know that we ignore some pretty important people. TrueNorth thinks social networks and engagement of loved ones (especially the chosen advocate) is absolutely critical for a patient’s choices for care to be honored. Our platform enables and encourages communication and harnesses the power of social networks through our Facebook app and secure email sharing. When we are all on the same page, we can ensure that patients’ voices are heard. 3. We know that we forget that behavior change happens in stages. This stuff is hard – emotionally and logistically. Whether it’s losing weight or quitting smoking, we acknowledge that behavior change happens in steps. For something as sacred and important as ones’ choices for end-of-life care, we should apply the same understanding and consider what steps make sense to take right now. 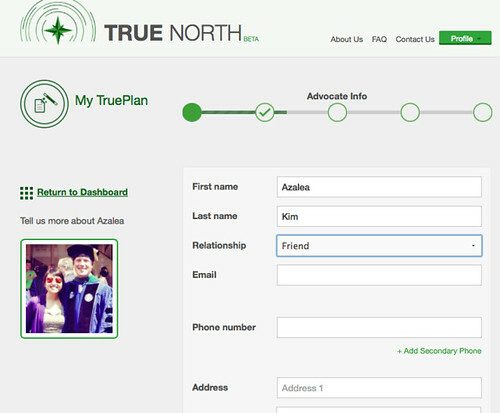 TrueNorth seeks to meet users where they’re at. We’ve created an excellent tool for anyone to get started on this really important process. As a TrueNorth user, we hope to engage with you over time to help support and document ongoing conversations with your loved ones and your care team. We see the potential for our relationships with users to blossom over time. 4. We know that your wishes are not available where and when it’s needed – in your doctors’ and care teams’ hands. TrueNorth wants to deliver this important information to your doctors and care teams through integration with electronic health record platforms. As healthcare providers, we know how important documentation of patients’ choices in developing a plan for your care. As we continue to develop partnerships with providers across the country, we will make available your up-to-date TruePlan data. We’ve already created an awesome product for demo that’s been validated by organizations that care for people who can benefit greatly from TrueNorth. But we’re not done yet. 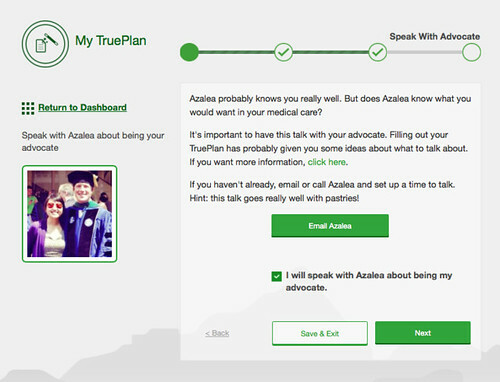 We need your help to make our platform available for every adult in the US to use our platform to complete a TruePlan. Our beta is so close to launch, but we need one last push to get it out there. 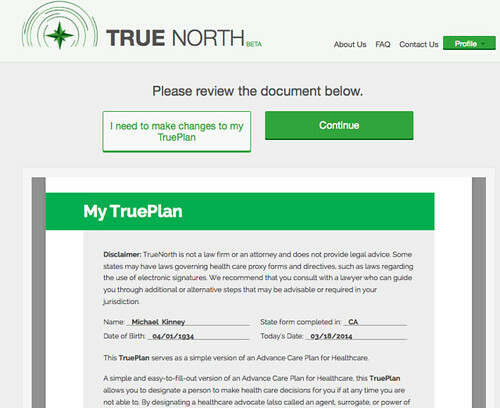 Our goal is to launch TrueNorth for EVERYONE and to do so by April 16, 2014 — National Healthcare Decisions Day. 1. To achieve an amazing user experience – $15k gets us another month of much needed work by our development team at Happy Fun Corp. While we’ve completed the user interface, there are functions in progress that we think are critical for our successful launch (i.e., updating your TruePlan, managing a TrueNetwork, sharing your TruePlan securely with others). We know that advance care planning isn’t an easy task to confront – we want to make the process as user-friendly as possible to encourage adoption and completion. 2. To ensure that our platform protects users’ privacy and confidentiality (super important!) – we are working with cloud-based HIPAA solutions that will allow us to scale and ensure that we our managing our data correctly and responsibly. 3. To ensure that we can handle volume – Your funds will give us the resources to provide the service and upkeep for the potential volume of users on our platform. To date we have raised some funds through grants and accelerator/incubator investments that have been stretched to cover all our development, legal, and operational costs to date. We are so close to launch – can you help us get there? h2.How Will We Use Your Contributions? If we don’t reach our goal of $15k, all the funds we do raise will go directly into launching out platform. If we exceed our goal (we hope we do! ), the additional funds will go to making critical enhancements to our site, including translating our content into Spanish and developing additional education and documentation modules to support users and their loved ones through future steps of advance care planning. *TrueNorth reserves the right to edit the content of our contributors before posting on our website and to not utilize content that is deemed inappropriate. Who is TrueNorth and Why Do We Think We Can Succeed? Amy is currently an internal medicine resident at the Brigham and Women’s Hospital, in the Department of General Medicine Primary Care Track. She orients her clinical work around her interest in improving and revolutionizing end-of-life care for patients through improved healthcare IT. Her prior experiences include payment reform initiatives with the Brigham and Women’s Physicians’ Organization (BWPO), interning at the World Health Organization in Geneva, and sitting on the Publications Committee of the New England Journal of Medicine. Amy received her BA in Geography from Dartmouth College, her MBA from Harvard Business School, and her MD from Harvard Medical School. Michael brings his prior experience as a hospice counselor and insight into the patient’s perspective to the design, messaging, and functionality of the TrueNorth platform. Currently a Health Policy and Management MPH at UC Berkeley, Michael has contributed to the strategic planning and business development of some of Northern California’s leading palliative care and patient-centered institutions, including UCSF Children’s Pediatric and Palliative Care Program, the Coalition for Compassionate Care of California, and the California Healthcare Foundation’s advance care planning initiative. During her third year of medical school, it was an experience caring for one particular patient at the end-of-life that left an impression on Azalea. Unable to speak for herself and without a designated healthcare proxy, her patient’s care at end-of-life was invasive and poor in quality. That experience motivated her to tackle this important issue in patient care and sparked the idea that has become TrueNorth. Azalea’s prior experiences include work with Montefiore Pioneer Accountable Care Organization, Kaiser Permanente Health Plan Community Benefit, and the Commonwealth Fund. Her research has been published in the Journal of the American Medical Association (JAMA), Health Affairs, and General Hospital Psychiatry. She received her BA from Princeton University in the Woodrow Wilson School, her MPA from the George Washington University, and her MBA from Harvard Business School. She will earn her MD from the Icahn School of Medicine of Mount Sinai in 2014. LinkedIn prior experiences include working with Bain and Company’s Chicago office where she consulted in the medical devices, pharmaceutical distribution, and third party insurance administration industries. Margaret also worked at the Center for Medicare and Medicaid Innovation. She received her BA in Economics from the University of Chicago and her MBA from Harvard Business School. We also have been supported by an amazing advisory board comprised of luminaries in the fields of palliative and hospice care, health systems reform and accountable care, and healthcare innovation and business. Their advice and encouragement has helped get us this far! Getting the word out to your networks about our campaign – we would love you to spread the word about TrueNorth! Connecting us with resources to make our product better – some areas we are already getting ready to tackle is translation of our platform into commonly spoken languages.